I presented this talk at a conference yesterday entitled Grand Tour of the 3rd Millennium, hosted by the University of Rome at Tor Vergata. I chose the topic when I looked at the calendar. On April 21 Rome celebrates its 2,765th birthday. The following day is Earth Day, a holiday that has been celebrated only since 1970 but which marks a planetary history of roughly 4.5 billion years, in comparison to which Rome’s long history is minuscule. While it’s easy to associate cultural heritage with Rome and environmental sustainability with the Earth, I am interested in building bridges between these two fields both locally and globally since I see the city not as the source of our global environmental problems but as the solution…. Can Rome leverage its richly layered history to sustain itself economically and ecologically? Can it re-use the resources accrued over time to avoid excess consumption? 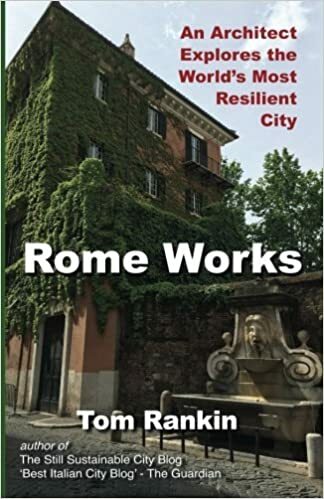 I believe it can and teach a course called Ecological Urbanism which uses Rome as a Laboratory to address themes such as waste, energy, water, transportation and land use. Historically we can register the city’s swings between moments of material growth and moments of frugality and adaptation. While conventionally the growth periods are considered the high points, I subscribe to an upside-down view of history, inverted to recognize those moments when limitations have lead to frugality which has nurtured innovation, whereas the periods generally identified as ones of great “success” (the Roman Empire, the Renaissance, or the late 20th century economic boom) have been those of greatest inefficiency, inequality, waste and environmental destruction. In Rome we can see relatively clearly these urban cycles, this swinging of the pendulum, from expansion to frugality. I am fascinated with a Rome when the city was more disabitato than abitato, when the Colosseum provided not entertainment but shelter for thousands of families. If regal and repubblican Rome were strengthened by agricultural knowledge, late medieval Rome shows a more complete ecological knowledge. Pre-existing structures and spoils served primarily as raw material to feed back into the cycle of building, what William McDonough and Michael Braungart in Cradle to Cradle call technical nutrients fed back into the production cycle the way biological nutrients are fed into the natural one. In the city of spoils (which was also the city of orti inclusi) we see this happening. A final example of this re-prioritized history might be the ingenuity and energy of the cultural production of the post-war years, a period of neo-realist frugality sandwiched between the sventramenti of the fascist city, the demolitions and with few notable exceptions the mostly banal, monumental classical constructions that filled the gaps) and the Italian economic miracle which opened the floodgates onto speculative real estate expansion and the invasion of cities by the automobile. This post-war period saw the creation of new planned INA-casa neighborhoods and the progressive policies of Adriano Olivetti, among other positive developments. From the Renaissance through the early 3rd millennium cities are almost continuously shaped by instrumental functionalism or determinism, as machines for processing material and producing growth, profit and waste. At times local feedback loops, smog, slums or energy shortages encourage rethinking of the city but the goal is always to minimize short term, localized disturbances, often by retreating from the city and often at the cost of squandering non-renewable resources. This instrumental thinking was conducive neither to heritage conservation nor to environmentalism. In the mid-20th century large areas like the West End in my home town of Boston were bulldozed to make way for new structures, erasing historical fabric and wasting material resources, a losing proposition for both culture and ecology. In the 1970s and 80s, when I was in architecture school, after an important but very fleeting burst of environmentalist thinking from the likes of British economist E. F. Schumacher (Small is Beautiful) to American engineeer Buckminster Fuller (Spaceship Earth)–and here in Rome with the Club of Rome’s release of Limits to Growth, there emerges an interest in history. The artifacts present in the city, rather than obstacles to progress, began to be recognized as deposits of meaning. For theorists of the post-modern, the value of history was often in its age and its aura, the associations that come with it, not in its actual material. So busy was it trying hard to look “contextual” or vaunting pithy, mannered, historical references that it ignored its own role in the evolving city, often replacing real history with an ersatz version. Fortunately, little of this marred Italy, although Italian architect Aldo Rossi was one of its (inadvertent) perpetrators. Instead of reading history as pure meaning to be quoted knowingly (the historians’ reading) or as pure material to be recycled (the bricoleur’s reading), can architects accept the complexity on both levels, treating urban design as a process of increasing knowledge and performance through critical acts of preservation and urban transformation? For Cesare Brandi the first step in deciding if a work of art is worth preserving is recognition of it as a work of art: the second step is preserving its material support. This distinct yet inseparable quality of aura and tangible composition, of meaning and material, underlies our reading of cities. In recent decades, Rome’s administration, out of some inexplicable inferiority complex (who knows where this comes from? ), has shown an inclination toward the new, fruit of an economic system which funds projects only when they can be reduced to immediate deliverables, not when they take time to prove their worth. Is this simply because of commissions and contracts proportional to the cost of construction (but independent of long term cost, performance or externalities)? Electronic ticket machines which are eyesores even before they break, museums which eclipse their collections, containers which overshadow their contents. The challenge as a designer in a rich and complex urban context (none more so than Rome) is not to compete and to stand out–with exceptions made for temporary exhibits and ephemeral projects of which Rome has a great history, most architecture has consequences that should prohibit it from following fleeting trends of fashion. No one but a few critics and historians will care about how daring or unprecedented a project was after it has been in place for a few decades. Nor should our objective be to embalm the past under glass as if history has ended. From the easy co-opting of history for history’s sake to the fetishization of the new and then a simplistic fixation on the catchword “sustainability” to which everyone today pays lip-service, I propose a different model for urban transformation. We have been brainwashed into believing that growth is a given good, but there are many situations where bigger is not better, where growth instead could mean fitting greater complexity more efficiently and appropriately into smaller space. Jane Jacobs differentiates expansion from development. In cities both forms of “development” are constantly at work, that of extension outwards, exceeding limits in a radial fashion, filling greenfields further and further out into the former natural landscape. And, the opposite operation, that of increasing the value of space within limits. When a shopping mall goes up on the outskirts of Rome it is the former. When a garage becomes a market it is the latter. Some of the best examples of urban interventions I know are the latter. Scarpa’s Castelvecchio. Theatre of Marcellus. Carmassi. Laccatan Vassal. McDonough and Braungart might term this upcycling, taking a building used for narrow-minded program such as parking and raising it to higher levels of creativity and complexity. And then there are interventions like the CASE in l’Aquila which, while architecturally sustainable, fly in the face of all notions of urban ecology. Architect Paolo Soleri, who along with Bucky Fuller I consider one of the most important people of my age, coined the terms “complexification and miniaturization of the city” which, he said, “enable radical conservation of land, energy and resources.” Understanding the difference between chaos and complexity, between expansion as we see in our cities and miniaturization as we see in our electronics is crucial today. We cannot afford to continue on the easy route of uncritical consumption of resources, a path which leads slowly but surely to what physicists term “heat death” which means not burning up in a fiery apocalypse but reaching an equilibrium in which there is no hot or cold but only tepid. no high or low but flat, no black and white but only grey. No city or country but only urbanized areas. We all know that to achieve true simplicity is one of the hardest, most complicated tasks a designer can undertake and far from simplifying an overall system it adds a layer of true complexity, thus fighting the tendency to mess up order which is architecture’s chief enemy: entropy. Good architecture is like editing; we take what has come down to us over the ages, we analyze it critically, evaluating what works and what doesn’t work. We use the existing as our raw material, whether it be vertical facades, stratified landscape, perspectival views or consolidated culture and commerce. In college I used to be a dj and was most interested in remixing existing songs and combining them with sampled sounds to compose aural experiences. 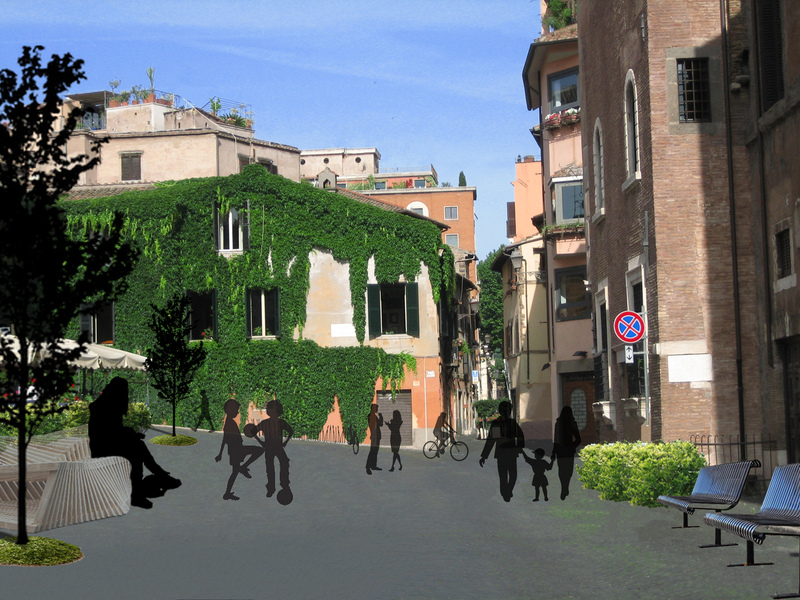 In my early years in Rome I found myself doing something very similar with the city. I was drawn to the city by its architecture, fascinated by the prospects of designing in it but more importantly recognizing the wealth of treasures already there. I created an organization called Scala Reale whose goal was to design itineraries. Not guided tours, although our work was often confused with that, but painstakingly orchestrated and then skillfully improvised experiences beginning in one place at one time and ending in another place a few hours later. A few hours spent navigating the city, observing, investigating, discussing, documenting, tasting. Of course the Heisenberg uncertainty principle (the more precisely the position is determined, the less precisely the momentum is known in this instant) applies to this kind of activity and by moving through the city we were also participating. Like the observer in the Quantum Experiment, there is no innocent bystander. I like to find ways in which this act of observing becomes not a burden as in mass tourism but potentially beneficial to the city, a goal shared with organizations like Stalker, Urban Experience, Primavera Romana and an initiative I recently launched called Ecological Itineraries. We all love the chaos, everywhere you turn there is something, a broken column, an ivy covered wall, an outdoor trattoria, a speeding vespa, an abandoned factory, a gypsy camp, a fascist-era borgata, a cluster of foreign priests, a Bernini. But it is too easy to use this celebration of chaos as an alibi for destruction. Anything goes so i’ll add to the collage with signage, with unregulated growth, with commerce and cars everywhere. All the stuff Woody Alan apparently (and understandably) edited out. Cities like Rome present the tremendous advantage of providing quality of life without the need for physical consumption. In our present failing economic system this is anathema because without waste there can be no profit, but this system is on its way out and we are transitioning into another paradigm in which the value of cultural complexity (conservation) and the value of environmental science will come to dominate while the rampant consumption of land, water, energy and other limited resources will be stigmatized and discouraged if not entirely criminalized. Between these two camps, no longer switching from side to side according to fashion but working hard to mediate and coordinate, will stand designers. Professionals in the field of cultural heritage are trained to recognize value in artifacts by selectively, critically stripping away the detritis around them to achieve an understanding of stratifications and then make this evident and comprehensible for present and future observers. Environmentalists work to ensure that our actions don’t harm the natural systems of which we are a part, or even better that we work to reverse the damage. So while archaeologists remove soil and vegetation to discover man’s constructions, environmentalists remove the detritis left by man to allow nature to prosper. It sounds like two worlds at odds, especially when we consider the agenda of many newcomers to the environmental movement who see in it an opportunity for development and profit, what my friend Nunzio calls i mercanti dell’ambiente. We see the formation facing off, on one side the preservationists declaring hands off all historical artifacts, beware all who might add solar panels, replace leaky windows or even think of adding south facing greenhouses to improve energy efficiency and reduce the ecological impact. On the other, progressive green architects imagining a future carbon neutral city existing in harmony with a restored nature. But I believe both are working toward the same ends. The greenest building is that which already exists, but it is a starting point, not an end. I believe we can dialogue with the past, operate on our cities in ways that improve our performance but also our fit. It is not enough to reduce the negative impact of our cities. We have to ensure that our impact is positive, regenerative. It is a design problem in which the architect has the onus of bridging the gap between cultural knowledge and scientific knowledge. 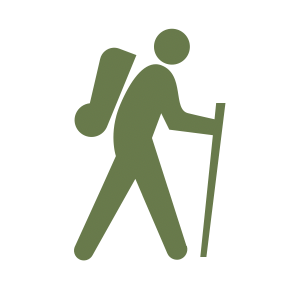 Your blogs are spot on, inspirational and thought provoking. Having just returned to Australia after 9 months circumventing the world mostly by rail and bicycle, we have entered into debates on how a new light rail through the city ‘will kill students’ and ‘cause traffic chaos’ and a financial disaster for the Gold Coast. Why because it will take 2 years to complete. Time cycles and political lifespan’s do not allow for Ecological Urbanism. Hopefully it will be, for us here, a time when sustainable options for transport and permeability can be introduced as a topic and allow us to rethink our future. Our four months in Rome are a constant reminder of the need to think of the past and how we can learn from it for the future. Sad to hear Arnold’s experience in his home, Australia. But… it is such a familiar refrain. I think Tom provides a clear argument against such limited thinking: that time cycles don’t allow for ecological urbanism. As he points out here, cycles precisely provide the impetus in history for smart development. It’s during periods of economic recession and limitation that innovative thinking about reuse and reinvention take place. And what I hear him saying is that the architect (a clarion call?) need to step into the dialogue and provide the kind of guidance required to ensure that such innovation creates a virtuous upcycling and increase in value. I am still trying to understand why bike sharing is not succeeding in Rome. We must be missing something fundamental and with the Ecoweek project planned for next week, I seriously want to get to the bottom of this mystery. What are we missing? Dan, Why doesn’t bike sharing work in Rome? The principle reason is the lack of political will; the powers that govern Rome are part of the automotive culture and seem happy to live in the city with one of the highest auto ownership rates and traffic mortality rates in Europe. Various management agreements have been made over the years but they are never allowed to function to their fullest potential, even when the same models work well in other cities. Most recently, one of the largest advertising firms, responsible for blanketing Rome in billboards, legal and otherwise, brought a law suit against the city claiming that the bidding process for the future bike-sharing system was illegitimate. What’s the connection? Bike-sharing in most countries derives its income from carefully regulated advertising; in Rome where illegal advertising is ubiquitous and unpunished (and therefore cheap) there is little incentive to invest in a costly project until the advertising market is brought into line. In short, a successful bike-sharing plan in Rome will require two things: enforcing traffic laws to make cycling more pleasant and less dangerous and enforcing advertising laws to allow a decent profit for those who provide a public service while respecting the environment. Good to know. At that price it’s clearly subsidized by the government which makes it even harder to get through the political hurdles. As you point out, maintenance is key and Rome doesn’t have a good record for maintaining technological innovations (count the “guasto” (out of order) signs on ticket machines, etc.). I don’t think they are subsidized directly – except to the extent that they do not have to pay a ‘rent’ to the municipality for the space they use for the stations and that the municipality gave the winner of the tender a 5 year monopoly.